Previously a derelict spinning mill, Tower Mill has been completely transformed into a 108-seat auditorium configurable as a cinema, theatre and conference centre; a café bar open seven days a week from early till late; meeting rooms to hire; and workspaces to rent. Tower Mill screens c. 300+ films per annum, was an early adopter of satellite broadcasts including NT Live, ROH Live, RSC Live, and produces 100+ live events and festivals throughout the year. Tower Mill is home to the award-winning Firebrand Theatre Company and to the international Alchemy Film & Moving Image Festival. It also manages the Civic Space which hosts events and local festivals including a Farmers’ Markets. 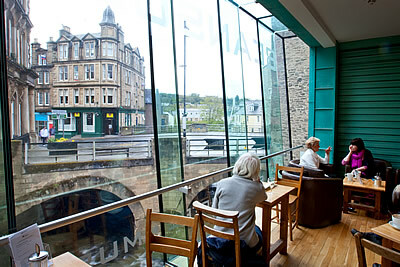 Filmhouse is a world-class independent cinema, home to the Edinburgh International Film Festival. Tower Mill, working with Filmhouse since day one on film bookings, screens a wide range of films including world cinema, foreign language, arthouse, mainstream, blockbuster and family films. 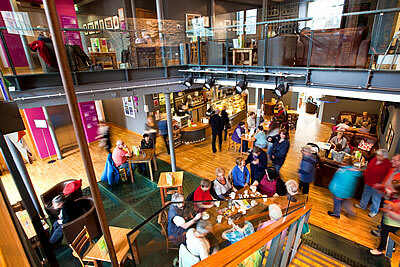 VisitScotland provides a year-round visitor information and reception service and also operates Tower Mill’s box office system. VisitScotland staff are highly trained in customer service and their professional, friendly and helpful approach is often commented on in customer feedback forms. Heart of Hawick started working with Firebrand in 2012 and co-produced a touring production of Iron by Rona Munro in the autumn of that year, starring Blythe Duff. Creating and producing new work at Heart of Hawick, transferring to The Traverse Theatre in Edinburgh and The Tron Theatre in Glasgow and then touring was a first for the Scottish Borders. The tour generated widespread national media coverage and also provided opportunities for mentoring and on-the-job training of producing, stage management and technical skills sets. Blythe Duff won the 2012-13 Critics’ Awards for Theatre in Scotland Best Female Performance, described by Joyce McMillan of The Scotsman as “world class”. HoH has continued to work with Firebrand, producing high quality award winning drama year on year. Alchemy is a partnership between Heart of Hawick and Alchemy Film & Arts. There were over 750 film submissions in 2014, three-quarters of which were from abroad. The festival attracted 53 visiting filmmakers from the USA, France, Netherlands, Switzerland, Sweden, Croatia, Hungary and the UK. 32 volunteers contributed their time in a variety of roles: invigilation of film installations, drivers, photographers, hosting of visiting filmmakers, Screening Room technicians and information guides. Backgrounds and experience ranged from High School and Undergraduate Students to retired individuals with past experience in the arts. The 2015 festival held in April was highly successful in terms of attendance, customer feedback, film making activity, submissions and partnership development.